At RMLA, Rob Maday Landscape Architecture, the underlying theme in all of our work is one of Pattern Shift. We help clients through the entire design process, from design to construction, and maintain an intimate relationship with the spaces we create well after the last plant is in the ground. The end results are lasting landscapes that are functional, sustainable, and memorable. Rob Maday, ASLA, graduated with honors from Cal Poly State University San Luis Obispo, College of Architecture and Environmental Design, with a degree in Landscape Architecture and a desire to create landscapes in keeping with California’s climate and culture. Since then, Maday spent many years working with notable landscape architects such as Grant Castleberg, Phil Suding, and Lane Goodkind. Maday established RMLA in 2009 and has garnered years of managerial and design experience with a diverse group of work including residential, estate gardens, large-scale residential developments, habitat restoration, commercial, and institutional projects. He leaves a trail of satisfied clients and memorable landscapes in his wake. With offices in Santa Barbara and the San Francisco Bay Area, RMLA's work encompasses a wide swath of California's mediterranean landscape. In addition, Maday founded, developed, and maintains LandscapeResource.com. 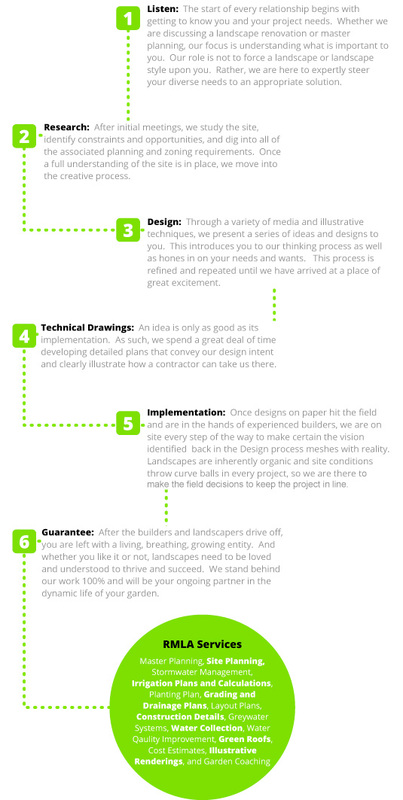 The community site's mission is to inform and inspire a diverse audience about responsible landscaping. Keir Smith has been with RMLA since 2012 and graduated with honors from Cal Poly, San Luis Obispo with a degree in Landscape Architecture. After graduating Keir interned at Lotusland, a world renowned botanical display garden in his hometown of Santa Barbara, CA. This experience energized his desire to create innovative and unexpected landscapes. Keir then worked as a designer and construction supervisor for a prominent landscape contractor in Santa Barbara gaining valuable experience in all aspects of the construction process. This background has enabled him to see a project through from the initial design concept to final construction walk-through. RMLA takes great pride in providing cutting edge graphic representation to our clients and Keir has helped to advance this aim. Mackenzie joined the team in late 2016 after spending many years working in the architectural field as a designer. Although her formal training is in landscape architecture from Cal Poly, San Luis Obispo, Mackenzie brings a diverse and unique view of the design process to our office. Additionally, her experience as a Master Gardener adds another layer of deep plant understanding to our team.